Ardbeg isn't the most popular Scotch single malt. It's not even the most popular whisky from Islay, the rocky corner of Scotland that produces those love 'em-or-hate 'em smoky, peated malts. But it's got a fan base whose enthusiasm knows few peers. The Ardbeg Committee, as it's known, has grown to more than 120,000 members worldwide since its inception in 1999 — about 40 times the population of Islay itself. The Committee's international holiday is known as Ardbeg Day, during which gatherings of the faithful take place around the globe, while back at the home office, another annual limited edition whisky is released. Each Ardbeg Day bottling is tinkered with in some unusual way by Dr. Bill Lumsden, Ardbeg's "Cask Master." Dr. Bill tinkers relentlessly, and he's justly renowned for his innovations in aging whisky, experimenting with different kinds of barrels, finishes, woods, and one one occasion even launching a small amount into space. Each Ardbeg Day release comes in two variants — a "Committee Edition" and a standard release. The Committee Editions, bottled at cask strength and available exclusively to Committee members (it's free to join, if you're wondering), routinely sell out in a matter of hours online. The hysteria was so overwhelming, in fact, that this year Ardbeg's website wound up crashing as a result all the traffic. Not every Ardbeg Day whisky is a classic, but some, like 2011's Ardbeg Alligator, have become legendary. Which brings us to this year's Ardbeg Day release. Ardbeg Grooves sports some goofy psychedelic packaging, but there's nothing goofy at all about the whisky. Grooves is aged in ex-red wine casks that had been heavily charred, creating grooves on the surface of the wood. The Committee Edition, bottled at 51.6% ABV, is now history unless you're prepared to pay through the nose on the secondary market, but the more common, 46% ABV version of Grooves is a winner as well. This is Ardbeg we're talking about, so of course your taste buds will be caressed with bonfire-on-the-beach-at-dawn flavor of smoke and salt and iodine that's so distinctive — and, for Islay fans, so delicious. But the wine casks add undertones of dark fruits, mellowing out the harsher elements of the peat and producing a rounded, slightly sweet final product. 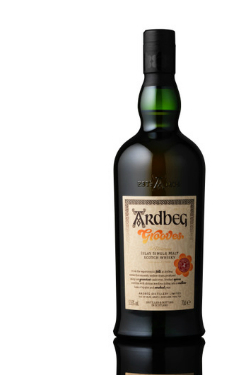 The wine influence complements the classic Ardbeg flavor profile rather than dumbing it down. It's a shame this is a limited edition — I could see drinking Grooves on a regular basis indefinitely. But I'm already looking forward to whatever tricks Dr. Bill has up his sleeve for next year's Ardbeg Day.